Being a bartender is a great job. You get to socialize, the shifts are flexible, and you earn tips. Do you want to become a bartender but don’t know what it takes? Try these simple steps to start your journey. ABC stands for alcoholic beverage control. These permits are obtained by taking classes, and they educate you in the art and business of serving alcohol. Having an ABC permit can help you stay well versed in the most current regulations so you avoid fines, insurance hikes, loss of your liquor license, or even business closure. Classic cocktails are going to be some of the most popular drinks people order, so it’s a good idea to know how to make them. Research some of the most popular cocktails so you have a good base knowledge of what your customers will order. Drinks like a Martini, Manhattan, Margarita, Bloody Mary, Long Island Iced Tea, Whiskey Sour, and an Old Fashioned are all considered classic cocktails. If you’ve ever spent time in a bar, then you’ve probably heard some of the bartending terms that most bartenders use. You can learn these during your training, but it’s beneficial to know them ahead of time. Terms like “on the rocks,” “with a twist,” “up,” and “neat” are all phrases you should understand. You should also know terms like shaking, muddling, or stirring, and how they change the way a drink is made. Before you step behind the bar, the best thing you can do is practice. You can throw a party with all your friends and play bartender for the night so you can really build up the skills and muscle memory it takes to become a good, quick bartender. Your friends can give you their honest opinion on how good your drinks taste so you can improve. The barback is basically the busser of a bar. They lift heavy objects like kegs and other package orders, and they run around the bar making sure everyone has what they need. Becoming a barback is a great way to get familiar with the bar if you’re not quite ready to become a bartender yet. 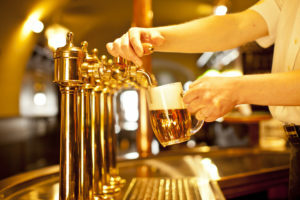 There are approximately 65,116 bars, taverns, and nightclubs across the United States today. If you want to bartend at one of them, make sure you get your ABC permit, memorize the classics, learn the lingo, and practice. All of these tips should get you on the path to success.